WTI crude prices are in the $44.75/b-$45.00/b range this morning. This week brought a sharp collapse on Wednesday, a modest decline on Thursday, and a gradual strengthening this morning. WTI opened at $44.25/b today, a significant drop of $0.44, or 0.98%, below yesterday’s opening price. 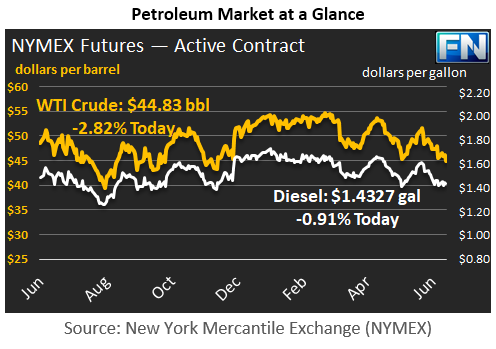 Current prices are $44.83/b, up by $0.37 from yesterday’s closing price. Diesel opened at $1.4113/gallon this morning. This was a slight recovery of 0.13 cents (0.09%) above yesterday’s opening price. Current prices are $1.4327/gallon, up by 1.81 cents from yesterday’s closing price. Gasoline opened at $1.44/gallon today, up 0.8 cents, or 0.56%, from yesterday’s opening. Prices are $1.4589/gallon currently, up by another 2.32 cents from yesterday’s close. This week’s price slump is shaped like a milder version of last week’s price collapse, which resulted mainly by the release of the Energy Information Administration’s (EIA) weekly supply data. Last week’s news of across-the-board additions to stockpiles and weak apparent demand started a sell-off. This week, the EIA reported a crude stock draw of 1.661 mmbbls, but this was counterbalanced by another stock build of 2.096 mmbbls of gasoline and 0.328 mmbbls of diesel. The weekly supply data also noted a drop of 48 kbpd in apparent demand for gasoline, falling from 9,317 kbpd during the week ended June 2nd to 9,269 kbpd during the week ended June 9th. Last week’s supply data reported a 505-kbpd collapse in gasoline demand. Apparent demand for gasoline for the first two weeks of June averaged 9,232 kbpd, versus an average of 9,596.5 kbpd during the four weeks of May—a drop of over 303 kbpd month-on-month. Gasoline demand typically continues to grow in June. Global oversupply continues to dampen prices. U.S. crude production rose again last week, by 12 kbpd, bringing U.S. production to 9,330 kbpd. OPEC released its production figures for May 2017, showing that Libyan output rose to 730 kbpd, up from 552 kbpd in April. Nigerian output rose to 1,680 kbpd, up from 1,506 kbpd in April. These two countries are not part of the OPEC-NOPEC production cut agreement. Low prices are expected to slow production gains, however, if they continue. If crude prices slide to around $40/b, it is believed that many development projects in shale plays and offshore may become uneconomical.